We source a wide range of White Westinghouse Washing Machines and White Westinghouse Drying machines that are widely known for featuring durable performance and high efficiency. These products are energy efficient and ensure great performance thereby offering complete customer satisfaction to our clients spread across the county. 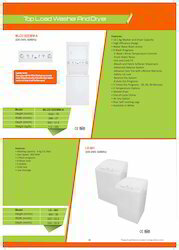 Our client can avail these from us at industry leading prices. 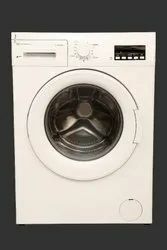 We are offering Top Load Washers that is an energy efficient washing machine with top load. A very comfortable machine used for cleaning and washing of clothes, this is available in several advantageous features such as automated drying feature, spin basket etc. Multiple settings and convenient features make this washing machine one of the ideal choice amongst our buyers. We import White Westinghouse Washing Machine that is highly reliable and ensures making the washing task more convenient by featuring multiple washing options for drying, spinning etc. Available in 10.1 kg capacity, this is very easy to use and ensures maximum performance. 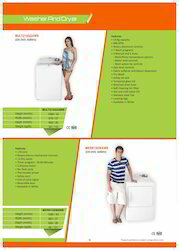 Looking for White Westinghouse Washing & Drying Machines ?